Sue the countries with a small emission decrease and ignore those with a massive increase. That will make the difference! Last week Wednesday I heard a short news flash on the radio. The room was rather noisy at that time, but I caught some bits and pieces: apparently a group of people prepare for a lawsuit against the Belgian Government, suing them for failing climate change policy. Back at home, I started to look for it on the internet, but found nothing. The next day I found a very small article in a newspaper, tucked away on the very last page below the weather forecast. A group of scientists, lawyers and artists are preparing for a lawsuit against the State. It was inspired by a similar lawsuit in our neighbor country, The Netherlands. A lot of questions arose: what is their standing? Negligence in the sense of what? At the moment they don’t want to give more information about the lawsuit, so I got interested in the lawsuit of the Netherlands. Here the organization Urgenda is suing the State of The Netherlands for not doing enough to avert “dangerous climate change”. According to their writing I guess they mean “Global Warming” with this. To declare that the Dutch State acts unlawfully by not conducting an adequate climate policy. Asking drastically bring back the CO2 emissions ie preferably by 40% compared to 1990 levels and to submit a realistic program to explain how it will be done. To request the State to better inform the Dutch population about the scientific state about climate change and associated risks. Update November 26, 2013: in the meanwhile this version of the summons (draft version 7 final) is replaced by the final version. In this final version the last point disappeared. I have some questions with the first request. Is the Dutch State conducting in a wrong way legally? Do they have a law that commands The Netherlands to lower emissions by 40%? As far as I know they signed international agreements, for example the UN climate treaty. Shouldn’t they go to the UN for sanctioning The State for not abiding to the treaty in stead of to a judge in the Netherlands? In the court summons there is a paragraph about the right of the next generation that could be taken into account and they want to come to the courthouse with a whole bunch of people (crowd pleading), probably in order to state representation of (a part of) the Dutch people. But I suppose the judge is not a scientist and could not possibly give a judgment on the science even if it was given, he can only give a judgment on the law. The second request of cutting down the emissions by 40%, let’s look at reality for a while: the emissions worldwide and in The Netherlands in specific. The EU as a whole is lowering its emissions and even lowering still. The emissions of The Netherland dropped in the last years, but if one takes the 1990 as a benchmark, they kept even. 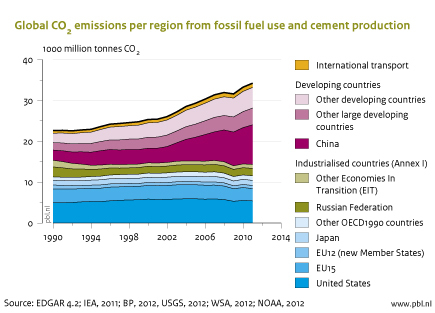 Emissions per capita is lowering. But look at India and China. They are increasing their emissions at greater speed. They are not done yet. And then we didn’t talk yet about Africa that eagerly needs more energy in the near future. Even the largest reduction possible in The Netherlands will be completely overwhelmed by all these numbers. The problem with emissions isn’t The Netherlands, nor Belgium, nor Europe. But let’s stay with the example of The Netherlands. Last figures I found were those from 2011. In that year the Dutch had an emission of 160 million metric tons. Worldwide emissions were 33,900 million metric tons. This means The Netherlands is responsible for a whopping 0.47% of the total emissions. Even with a 40% emission decrease in emissions the influence on the global temperatures would be a number with a lot of zero’s after the decimal symbol. Whatever reduction in emissions (even a complete reduction) would hardly be scratching the surface. For the Belgian situation it is probably even less. Looking at the graph, if they really, really are concerned about limiting global CO2 emissions, then they are suing the wrong countries! The last request for the judge is a tricky one. This could as well being a way to have even more one-sided alarmist views spread to the people. Why not just give BOTH views on the issue? And in a lawsuit, is it not the tradition to look at both sides of the issue and not only one as in this case (hiding all uncertainties)? This entry was posted in Belgium, Climate Politics on November 7, 2013 by trustyetverify.